Travelers will have fun learning to pronounce a few of the Hawaiian street names such as Kalākaua and the name of Queen Lili'uokalani. You will learn a Hawaiian song and dance the hula. Most of all you will love the legends, culture and history of Waikīkī by fully participating in the Hawaiian storytelling, singing, and dancing. Queen Lili'uokalani and Princess Ka'iulani held a special place in the hearts of the Hawaiian people. 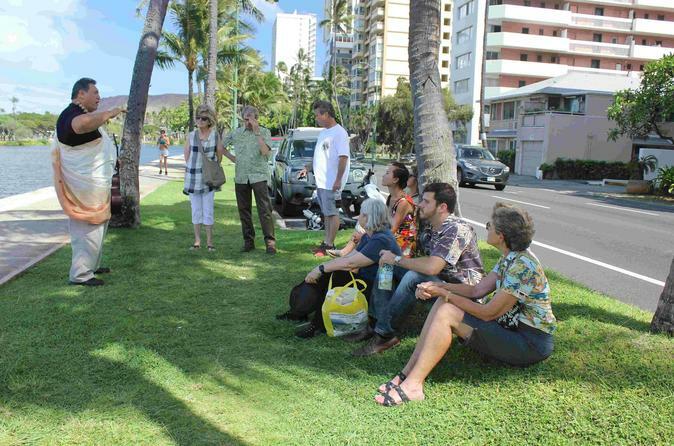 Your guide will take you on a "mele" tour, a singing tour. You will hear songs composed by the Queen while taking a guided walk through the royal estates of both Queen Lili'uokalani and Princess Ka'iulani, which are located in the heart of Waikiki. Start your tour at 10am with a quick lesson on pronouncing some of our Hawaiian street names and names of Hawaiian royalty. You will also learn a popular hapa haole Hawaiian song and learn to dance a hula. Before starting your journey on a cultural and historical walk, your guide will create a sense of place with a mele (Hawaiian song) composed by Queen Lili'uokalani. It is a tradition to welcome our guests. Walk outside and learn about the two most beloved royalty of Hawai'i: Queen Lili'uokalani and Princess Ka'iulani. Your cultural guide will describe where they kept their homes in Waikīkī and discover through song and story why they loved their homes. Along the waking path, you will hear the stories behind the Hawaiian names of the streets and experience a hula (dance) special to that place. You will even hear the legend of the pueo (owl) associated with the nearby park. Once you leave the park, the stories of Princess Ka'iulani begin. As with the Queen, your guide will tell stories and sing songs of a time our Princess lived in Waikīkī. Visit her stately statue and walk over to enter the Princess Ka'iulani Hotel, where you can feel her presence. Before her stunning portrait, you will hear historical facts about her aspirations and accomplishments for her people. This is the last stop where you will sing "Aloha Oe" a farewell song and bid your walking companions "a hui hou" a Hawaiian tradition of wishing each other well until you meet again. This cultural and historical walk is about half a mile.